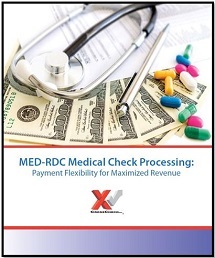 MED-RDC features all of the convenience of remote deposit capture check processing along with guarantee for patient payments and processing only for insurance payments, letting you choose the most cost-effective service for your practice. Medical offices, dental offices, clinics, physical therapists and more can utilize this service to streamline payments through electronic processing but only pay for guarantee when it’s really needed. Checks are easily and quickly processed using a PC and imager.